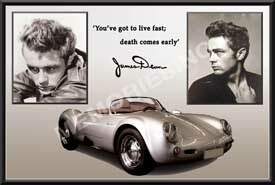 Most know how James Dean died, driving his Porsche 550 Spyder on Highway 466 in California. Dean even received a ticket earlier in the day, prompting many to assume that he was driving recklessly when the accident occurred. Later examination of the crash showed that the Hollywood icon was likely driving around 55 mph at the time of the crash; which was the legal limit at the time. While Dean was shooting the film Giant (released posthumously in 1956), the Hollywood superstar shot a quick public service video for the program Warner Bros. Parents. The short was about the dangers of speeding on the highway, and Dean insisted that speeding was for the race track and not for public roads. Chillingly, he ends the interview saying “Take it easy drivin’… the life you might save might be mine.” As Dean died soon after filming the short segment, it reportedly never aired. Hit the jump to view the two minute interview.